With competition to attract students to universities across the UK at a high, Wrexham Glyndwr University’s £60m Campus 2025 strategy is aiming to make Wrexham Glyndwr a top choice for students. Campus 2025 is the university’s strategy to significantly improve all areas of its campuses by 2025, with an ongoing schedule of works taking place over the eight-year project. 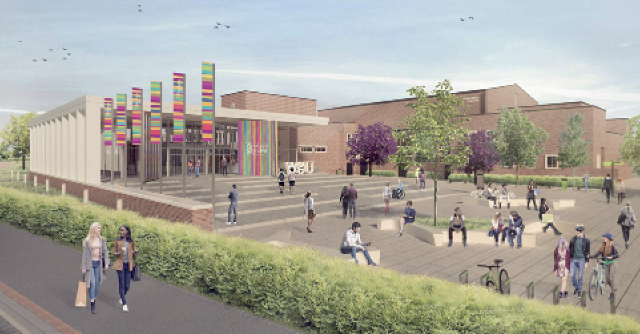 Plans include an overhaul of the teaching space at the university’s main Plas Coch campus, a new engineering building, refurbishment of the arts campus on Regent Street in Wrexham and the addition of bespoke student accommodation, plus refurbishment at the Northop and St Asaph campuses. The university’s ambition is to be the learning gateway into Wrexham and to contribute more to the local community. To achieve this, the university is doing more with the footprint it already has and future-proofing its campuses. A new scale-up teaching space launched in September 2018 has already seen fantastic results. In addition to the collaborative learning space ‘The Study’, which opened in March, the university has seen a full refurbishment of all catering facilities. A partnership with FA Wales was launched in August, which will transform the university’s Colliers Park site and create a National Football Development Centre in Wrexham. The university also acquired Wrexham Student Village in August – a 323 en suite bedroom complex. The acquisition is part of the Campus 2025 strategy to improve and enhance the university’s campuses for current and future students. One of the planning applications the university is awaiting the outcome of is to seek outline planning permission to build a further 200 bedrooms. The student village plans will provide a student population who will be economically active in supporting retail, leisure and other town centre uses. Students are at the centre of the Campus 2025 strategy and their experience will be enhanced by an infrastructure that supports learning, with stimulating state-of-the-art facilities and the latest in building designs and technology. The scale-up space, for example, is the first of many planned similar spaces and is equipped with a range of high-end IT infrastructure and technology, where academics interact with students in small groups and technology is used to enhance learning. Further plans include a new engineering building that will support local business and give students access to modern, well-equipped workshops to prepare them for industry. Plus, the new high-quality student accommodation will attract a greater number of students to live and study in Wrexham. The proposed redevelopment of Regent Street will further enhance its importance as an art school of national standing, while retaining a heritage building at the entrance to the town centre. Vice-chancellor Professor Maria Hinfelaar said: “We are enhancing the student experience by placing students at the centre of our Campus 2025 strategy. “Our plans have been broadly welcomed, because of the significant investment in university facilities, which will clearly benefit our students, many of whom are local, and raise the profile of Wrexham. “The main campus at Plas Coch is on a gateway into the town, and our Regent Street campus is a heritage building which houses many of our creative arts courses. This will result in better academic delivery and a sustained and increased student population. Wrexham Student Village still has availability for 2019. For more information, please click here.